This process is so enormously routine for a lot of people – but it doesn’t seem that way as you’re figuring it out! Jacking the boat up, ensuring that it will stay vertical, and doing it again in order to shift wood blocks under the keel, all feel like an enormous big deal. I’m happy to say that the boat is indeed still vertical, and the wood blocks are now repositioned under the keel, allowing for the remaining repairs and painting to go forward. The second round of jacking went smoothly, putting to use everything we learned from round number one. Stern lifted first, maintaining weight at all times on both stern jack stands, then up with the jack at the bow. 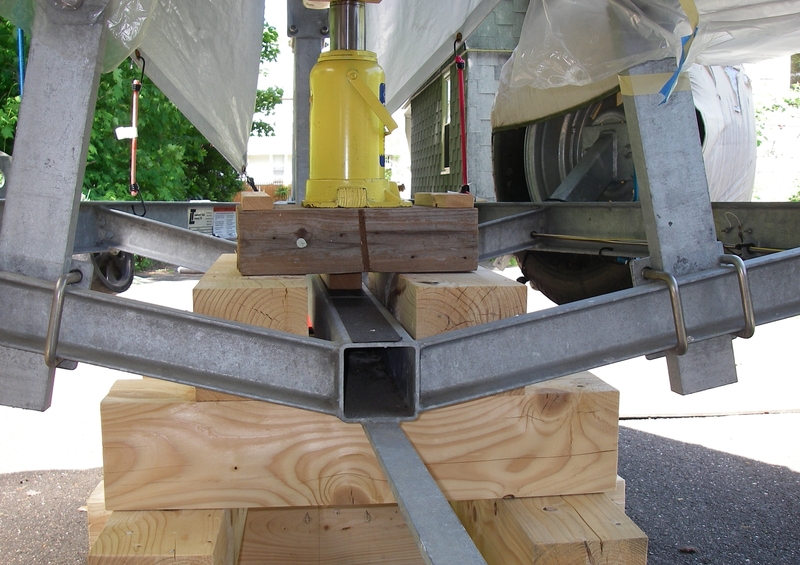 Blocks of wood positioned between the hull and the outer bunks for additional stability and safety, then reaching under to move the 4 x 4 blocks under the keel. 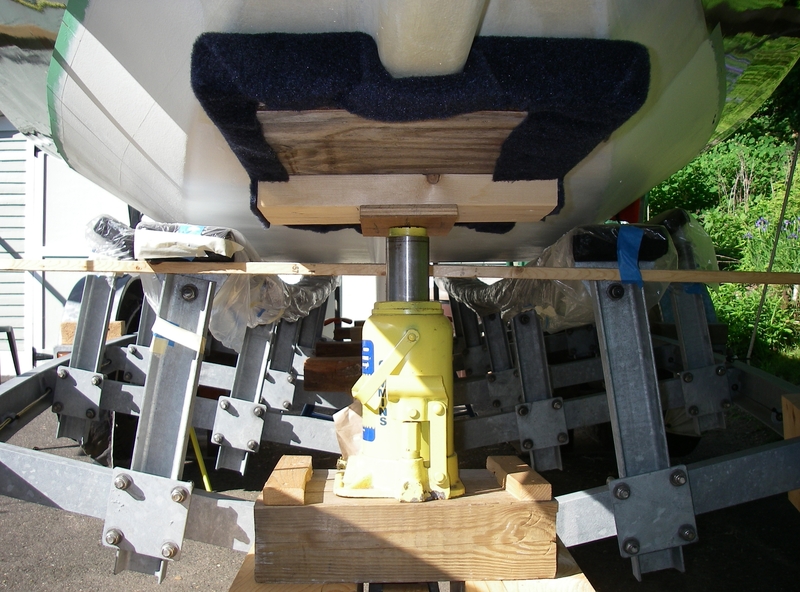 Then everything in reverse: blocks at the bunks removed, bow jack lowered, then stern jacks, until the weight of the boat was once again resting primarily on the keel. 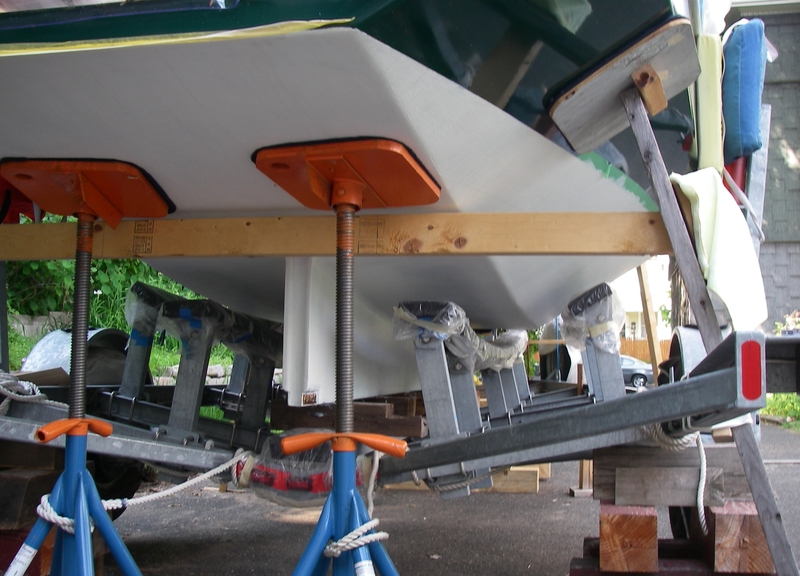 Assorted fiddling with side supports, and cushions kept between trailer guide-on posts and hull throughout the process. Since the last writing, we added extra supports at the stern, shown in the top photo, so that the boat would be stable without the wood blocks at the bunks. This has eased some of the pesky issues with the painting. I would have sprung for regular metal boat stands to do this, but the position of the trailer rails wasn’t going to allow for orienting the angled boat stands correctly. It was a little bit fussy doing the wood version, because of wedges for the funny angles where the pieces fit together, but in the end it has been quite sturdy, and pushing on the side of the boat yields no movement whatsoever. That’s been satisfying! Then there’s the paint. Regular bottom paint would be a lot easier, and if we had used it this process would have been done a while ago. Or, if we had a big, heatable shed, even the very particular ePaint would have been done long before now. 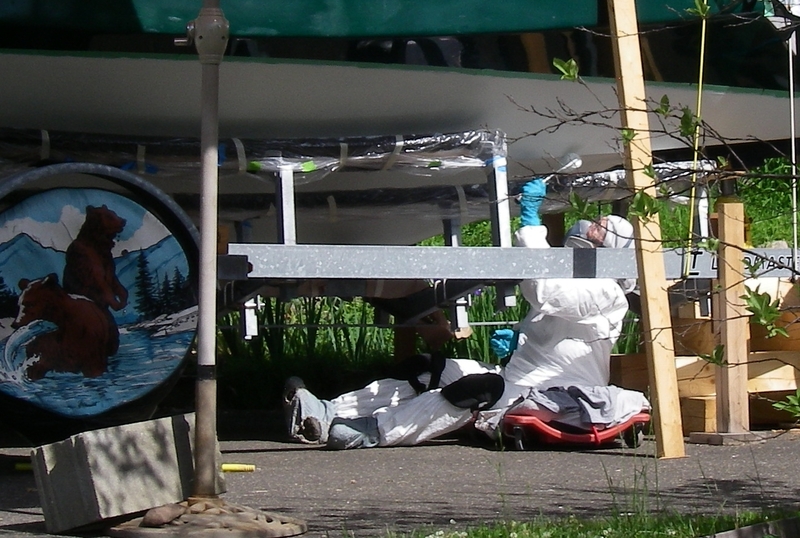 As it is, I still think ePaint is worth it, and the good weather this weekend should mean that the hardest part will be done, and we’ll be able to put the boat back down on the trailer. The paint we are using is EP 2000, which is one of the newer non-toxic antifouling paints, from the company called ePaint. (As always, I’m not receiving anything for mentioning this product by name.) I like this bottom paint because once it is on, it’s completely non-toxic, both for small creatures in the water and for people. No worries about letting the boat go down in the mud, or on a sandbar, and no concerns about rubbing off algae, or touching the paint with bare skin when swimming. It’s also nice for trailering, with a hard surface that doesn’t rub off on the trailer, and it’s unaffected by sitting out of the water for long periods of time. It works by reacting with UV light in sunshine, creating hydrogen peroxide, which the sea creatures don’t like. Algae is not perfectly deterred, but rubs off easily while swimming. My experience has been that barnacles do not grow on it, except for two or three on the entire boat over many months, and they come off easily using just a fingernail. That’s if there’s a decent amount of paint. The results of the test are that more layers of paint are a good thing! Everywhere that got the new coats of paint last year made out fine over the course of four months in the water – and the places that didn’t, that were down to pretty much one layer of marker coat, eventually had a nice crop of small barnacles. They were easy to take off with a plastic scraper, but there were lots of them. Hundreds. This was the main inspiration for all the boat jacking this year (well, this and the big down-to-bare-wood ding in the keel, unreachable against the trailer). Then there is the subject of ePaint’s fussy application requirements. At least 65° temperatures, and 50% or less humidity, for many hours after you put it on. On the bright side, if the temperatures are hot – 80 to 90° – the required number of drying hours is shorter. But still, in an outdoor New England setting, if you want to go sailing early, meeting those requirements can really set you back as far as timing. The folks at the company recommend having the painting professionally done… alas not so easy, so many miles from the coast. The other thing we’ve learned, through observation of the original paint that was done during construction, is that this paint really cares about being on top of either its own primer, or some other epoxy finish. Where it was painted on a bare bronze fitting, and then, as we found by jacking the boat up, where it was painted on bare wood on the bottom of the keel, it had cracked and curled, coming away from the surface. This is of course no fault of the paint – it’s a standard thing, for paints to need primers that they like. But it was interesting to see that it does indeed really matter. The guidelines actually say that it can be painted directly on bare wood, with a thinned first coat. We have no idea if that was done for sure, originally, but it probably was – and yet, the paint was busy removing itself. Coating the wood with epoxy feels like good insurance for the wood, as well as likely to be helpful for the paint. So now the bottom of the keel has had dings repaired, remaining old paint scraped away, and a coating of epoxy. Most of it has been painted, and now that the wood blocks have been shifted, the remaining spots have been scraped and epoxied and are ready for their own turn, to be done along with some more coats on the rest of the “trailer section” of the hull in the next few days. What a production! Suzanne is the brave soul with the scraper and the paint roller. “Gratitude” is such a thin word, in the face of all that! There is no denying that painting the bottom of Auklet is a hard job. But it is also incredibly satisfying to restore the bottom and see it all beautiful again! I savor this moment of fleeting beauty, because alas, Auklet is after all a boat and must return to the water. Treasuring that beauty, that is likely to last longer, even in the water, for all that special care!